Addis is a tough nut to crack. It’s one of those cities with no explicit reasons for you to visit, other than being home to the country’s sole international airport. Yet if you persevere, you’ll find that the diplomatic capital of Africa is a unique cacophony that wears its tumultuous history on its sleeve. There are buildings designed by Armenian architects (amongst the first migrants to the country in the 20th century), palaces and extravagant halls commissioned by former Emperor Haile Selassie, dramatic monuments erected by the tyrannical Derg regime, and countless high-rise and infrastructure developments plastered with Chinese characters; each of these reflecting the successive phases of the city’s history. To some, Addis Ababa may seem overwhelming and boring, but there are countless rewards to be reaped for those willing to jump in. The same roundabout in Piazza. Italian restaurants occupy Armenian-designed buildings in Piazza. St. George’s Cathedral, near Piazza. This photo encapsulates two aspects of Ethiopian society. On the left, a man encourages his daughter to donate money to an elderly woman. People in Ethiopia are very charitable, and you will constantly see people giving money to the disabled, elderly, homeless and clergy. On minibuses in rural areas, people will throw money out the window at passing churches for the priests to collect. On the right, a man prays up against the church gate. People in Ethiopia are very religious, and behind the gate you’ll see endless streams of people praying similarly up against the church itself. On the light rail, I also saw people praying the same way when when we passed churches. The image of sipping—neigh, eating—a layered juice smoothie while watching a rainbow flurry of Volkswagen Beetles push through the shared minivans and Lada taxis from a dim, yet characterful art deco café is not something that one might associate with Ethiopia, yet this is the quintessence of Piazza (peak Piazza, if you will), so-named by the Italian forces that occupied the county between 1936-41. Herein lies the first contradiction of the city, and perhaps the country as a whole. Wherever you go there are strong reminders of fact that Ethiopia (or Abyssinia) was never colonised. Every roundabout has a statue of a great emperor who defended against invaders, or statues that were looted or constructed by Italy, only to be returned as subversive symbols of anti-imperialism. Even talking to locals, you’ll soon realise how staunchly proud they of this fact (and rightly so), yet at the end of each encounter, a sort of optimistic curiosity towards colonialism emerges, as if the grass was somehow greener everywhere else in Africa. People often asked me if my country (Australia) had been colonised—yes—and if it had been good for the country—well not only would I not exist without it, but I continue to benefit from the privileges afforded to me as if colonialism never ended—but unfortunately the apparent nuances of how Indigenous Australians suffered and continue to suffer gravely to the benefit of white Australians were lost upon whomever I chatted with about colonialism. So regardless of their pride in never being colonised, the locals of Addis Ababa (and Piazza in particular) continue to eat pastries and sip macchiatos, despite having their own pervasive coffee culture (coffee was invented in Ethiopia, after all). As someone who doesn’t really drink coffee, and who found the pastries to be lackluster, there was a third Piazza staple for me to binge on: juices. More a local concoction compared to the other two, juices here are much thicker and denser than those I’m used to, so much so that instead of drinking it (don’t try, you’ll choke to your slow but delicious death), you’re given a spoon, something of a rarity in a country where 99% of food is eaten with injera. The favourites, nation-wide, seem to be avocado, mango and papaya—again, not exactly what I’m used to, yet in Piazza the trick is to ask for a spris, which 4 or 5 (or 6 is you’re lucky!) layers of juice, each a different flavour having been pureed in a blender rather than put through a juicer. Toss in a squirt of lime, a pinch of sugar and a occasionally a squirt of chocolate syrup (I won’t even pretend to understand that last bit, thankfully you can avoid it by going to juice bars that have fresh fruit hanging out the front) and you’re in juicy, Ethiopian heaven. To the north of the cosmopolitan hub that is Piazza sit several museums, supposedly some of the continent’s best. My pick is the excellent Ethnological Museum, housed in one of Haile Selassie’s former palaces known as Guenete Leul. More technically, it’s on the second floor of what’s now the Institute of Ethiopian Studies, toward the back of the campus of the Addis Ababa University. Here you’ll learn about Ethiopia’s multitude of diverse cultures from some quality displays, as well as official gifts to the Emperor from places as far-flung as Italy, Japan, Russia and Burma. But the highlight for me was checking out the bedrooms and bathrooms of the last emperor and empress. Funky, especially if you remember that they were built in 1930, a thought pattern which I found myself repeating throughout the country. Haile Selassie’s Guenete Leul palace, home to the Ethnological Museum. Haile Selassie slept here. Out of frame is a mirror with a bullet hole from an assassination attempt on the former Emperor. One of the displays in the museum. A fascist statue from the during the Italian occupation of Ethiopia. Each step represents every year of Mussolini’s reign at the time, while the Lion of Juda ornament added on the top step, was added after the occupation to mark the Ethiopian victory. 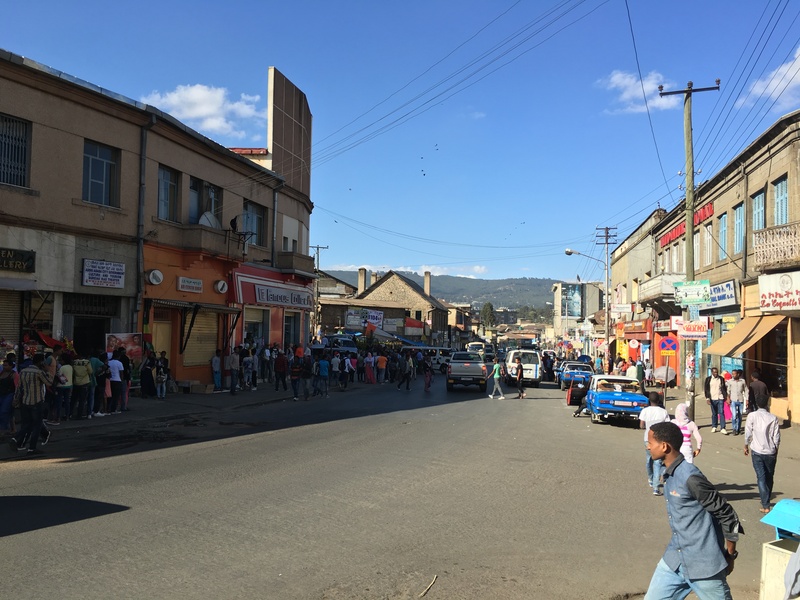 Addis is also home to the continent’s largest outdoor market, perhaps befitting its status as the capital of Africa. I was met with some strange reactions when I told other travellers that I’d be heading to Merkato alone without a guide, but I didn’t worry because, I mean, I don’t need someone to teach me how to walk around some shops, right? Turns out that Merkato is big—like really big. It’s the size of a large suburb, and the laneways I expected to get lost in turned out to be wide enough for street traffic. Not that there was any; the streets were so full of people buying, selling and transporting goods that you’d never fit a car or even a motorbike in there, except for a select few streets where you have to play frogger with the reversing delivery trucks. Visually, Merkato was also not what I expected. Instead of canvas-roofed stalls or wooden tables lined up in a row, Merkato resembled more a slum, albeit much cleaner. That is not to say that business is bad; the seven-thousand-odd corrugated iron shacks may appear full to the brim but their proprietors are wheeling and dealing like nothing I’d seen. These guys also tended to be some of the friendliest people in the city, joking around and sometimes even making a show of their carpentry and metalworking skills. That’s another thing: Merkato is not just a retail area but a light industrial area too! You’ll see streets snowing with sawdust as teams of men labour away at bedheads and doors, and sparks erupting from others as scrap metal is reworked into literally anything you can think of. Recycling is quite prominent here actually, with heaps of stalls dedicated to making coffee paraphernalia from old cooking oil cans, or dumbbells from disused cogs. A street selling bolts of cloth in the fabric area of Merkato. Autobus Tera, just outside Merkato. A quiet street on the outskirts of Merkato. Coffee paraphernalia being traded in Merkato. These photos don’t really do Merkato any justice in terms of portraying how busy it was, but I was too caught up in the place to remember to take photos (I took this as I made my way out tbh). 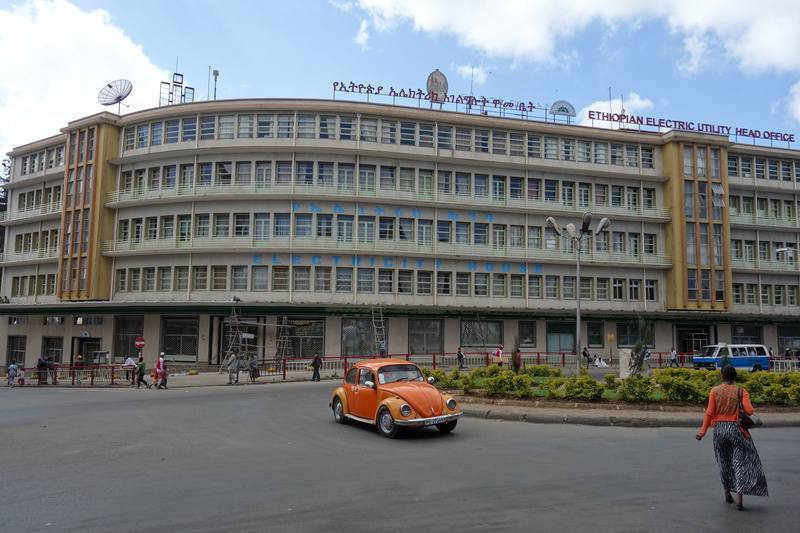 Right around the corner from Meskel Square, however, is the Red Terror Martyrs’ Memorial Museum commemorating the victims of the Ethiopian Red Terror during the communist Derg regime of the late 70s. The museum is quite small (you could spend half an hour there if you wanted) but it’s extremely well put-together and a very moving experience overall. Not only are there the usual photos and artefacts, but there are walls upon walls of small photos of each (identified) victim along with countless skeletons (some identified, others not). These type of displays make it easy to feel the gravity of such tragic events that I knew nothing about before entering. Another thing is that the museum also criticises the reign of Haile Selassie, who apparently wasn’t the benevolent, freedom-fighting statesman he’s made out to be everywhere else. The museum draws parallels between the two regimes and even openly sympathises with those who participated in the countless protests against Selassie which led to his downfall and the establishment of the Derg. In short, this was a great museum and unmissable for any visitors to the city. Meskel Square, packed with buses mid-morning. Meskel Square late in the afternoon, with people attending a festival that mostly sold laundry detergent for some reason. Also unmissable is the food, obviously, though aside from my beloved spris, nothing particularly stood out compared to what I ended up having in some of the other towns. Fir fir does get a special mention, as it was apparently way more popular here than anywhere else, however when you have it for three meals in one day because you only wish to order by pointing at others’ meals or by playing roulette with an Amharic menu, it gets old. Personally, I can’t look at it the same way again, especially considering it’s typically a breakfast meal. No thanks. Lesson learned: don’t get cocky. Actually I stuck to my method elsewhere in the country and it tuned out amazingly, so scrap that. Other, more interesting meals are the kitfo and gored gored, both of which can be had raw. They’re beef, by the way. For those opposed to eating raw meat just think of steak tartare or sushi or something. For those already curious, think of it as the beef equivalent of sashimi. These beautiful chunks of meat take on such a fresh and wholesome, meaty quality that you won’t be able to stop. Unfortunately, if the pieces are too small or fatty/muscular, it just tastes like what you’d imagine raw meat to taste like, but if the chunks are big enough, prepare to have your mind blown. I should probably say that that the gored gored I had in Addis was easily the worst I had in the country, though it was still good, if that makes sense. Kitfo butchers happily chopping away. This was what I came to see, little did I know that Africa Hall was now part of a larger complex that is the permanent headquarters of the United Nations Economic Commission for Africa. So you’re supposed to phone in advance to book an appointment if you want to see the artwork, as the complex typically isn’t open to people walking in off the street. But it was for me. I had tried for a few days in advance, before I was actually even back in Addis, to ring the supposed number which I had double checked from several sources. No luck, so I decided to just ask nicely at the door. I’d just like to preface this by saying that the guards and all the staff in general were extremely friendly and helpful, more so than in the rest of the country, so in the following interactions they were very polite. I approach what I thought was the main gate. I can see Africa Hall looming just behind. I ask the guides if I’m allowed in to see the artwork, and they tell me that it’s by appointment only. I show them my long call history. They tell me that visitors aren’t admitted that day anyway, so I should come back next week. I explain that I fly out that afternoon. The guards genially empathise with my sob story, so they tell me to go to the gate around the back, and to hurry as by lunch time business hours will be over. I eventually find the rear entrance after walking longer than anticipated, and there are even more guards. I ask if I’m allowed in, and I’m told no. I say that I was sent here by the other guards who said that maybe these guards could sort something out. I’m sent to the next set of guards, who tell me that I needed to book an appointment. I flash my call history again and I get sent to the next guard, who only asks if I’m excited to see the artwork. I reply with an excited “yeah!” and I’m on my way through the gate, doors, and then metal detectors. Reception remains my final hurdle. I ask if I’m allowed in, and they ask me to have a seat. I end up waiting for an hour and a half until they call me back. I’m expecting to be sent out, and I’m a bit bored after having waiting so long. They explain to me that the two staff who serve as guides for the occasional visitors are not responding to any phone calls. Damn. They then continue saying that the shopkeeper at the complex’s bookshop will take me there instead. This lady did me a massive favour and I’m still extremely thankful. She walks me across the complex for about 15 minutes and we chat about my trip. She was fascinated by Lalibela and Axum, and explained that she had read so much about them in books but had never been able to visit. It’s such a shame, especially seeing as she’d probably appreciate them more than most foreigners (myself included). The stunning triptych of The Total Liberation of Africa by Afewerk Tekle. This message is particularly applicable to Addis as a city. 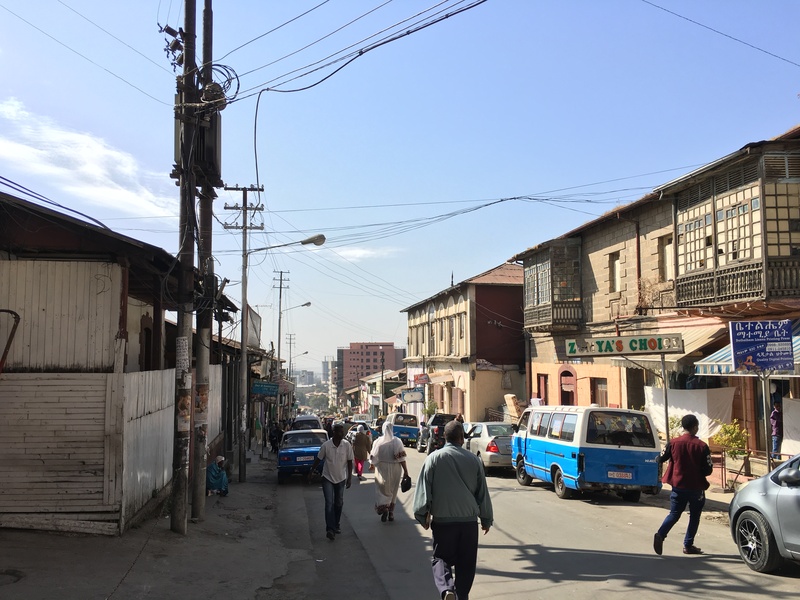 Addis then—each influence that has left its mark on the city. 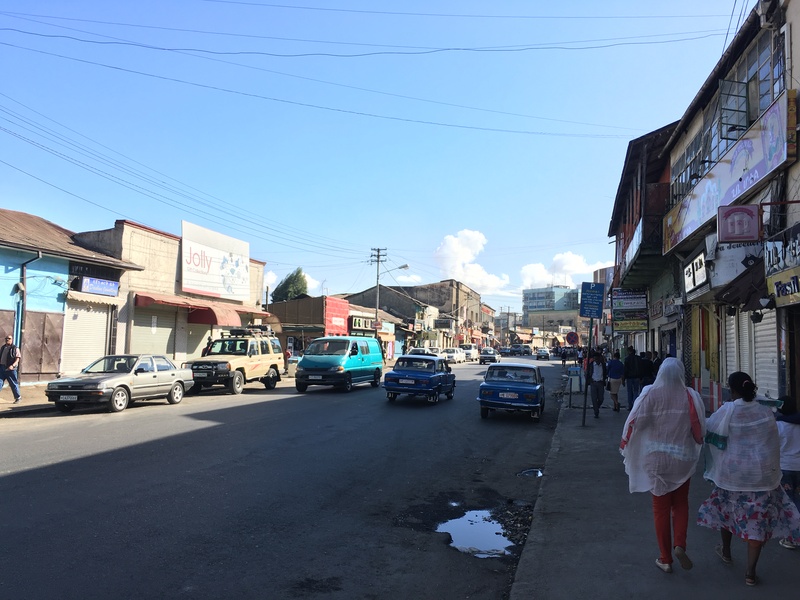 Addis then and now—how the city proudly engages with its omnipresent past. And finally, Addis now and in the future—the Chinese scaffolding all over the city giving a taste of what’s to come. For apparently everyone a few years older than me, the image one has of Ethiopia is a severe famine that sparked a grotesquely condescending Christmas carol which raised money that went into the weapons budget of the Derg which was in the process of implementing brutal, forced relocations. Oh that, and a simplistic understanding of an entire continent for decades to come. For me, and people my age, I guess there is The Weeknd as well as Kendrick Lamar shouting “N-E-G-U-S,” which is awesome but not helpful in understanding the country as it stands today. Detail of The Total Liberation of Africa by Afewerk Tekle. The stained glass shows people from all over the continent, in their respective traditional dress, united towards the common goals of liberation and unity. This cafe is one of the few proper buildings in Merkato. It got pretty packed. Cakes and pastries are abundant in Addis Ababa. They’re not bad, but still a bit flavourless unfortunately. The Tiglachin monument (also known as the Derg monument) was built by North Koreans in 1984 as a memorial to the Ethiopian and Cuban soldiers involved in the Ogaden War. It’s one of the strongest reminders of the communist Derg regime. Addis Ababa City Hall. Intended to complement Africa Hall, it’s funky design is unfortunately obscured by trees in all my photos. The underground light rail station at Menelik II Square. I just thought it looked cool. The Total Liberation of Africa by Afewerk Tekle. Thanks so much for the compliments Cecily! I’m in Nepal at the moment but I’ll be posting about Ethiopia (and beyond) again next month. Zac, thanks for dropping by my blog. Had you not shared your thoughts I would have missed your amazing blog altogether! As I opened the home page, I was immediately glued to your posts, especially since I’ve been dreaming of going to Ethiopia for quite some time now. Will definitely follow your stories from now on. You’re doing well with your blog, so keep up the good work! This is one of the best blog I read about my beloved country. cheers!!! Hey thanks Sisay! It means a lot coming from a local! !